VANCOUVER , Sept. 17, 2018 /CNW/ - Alexco Resource Corp. (NYSE American:AXU) (AXR.TO) today released results from fifteen drill holes which essentially completes the 2018 resource infill and extension drilling campaign at the high grade Bermingham deposit in the Keno Hill Silver District in Canada's Yukon Territory . The existing Bermingham resource comprises an indicated 858,000 tonnes averaging 628 grams per tonne ("g/t") silver ("Ag"), containing 17.3 million indicated ounces of silver. A total of approximately 8,600 meters ("m") of underground and surface drilling was completed at Bermingham in 2018. Results from this work will be included in an updated Bermingham resource estimate to be completed prior to month end. In the 2018 program, 24 holes were completed underground from the Bermingham exploration decline and 12 holes completed from surface for a total of 8,582 m of HQ diamond core drilling that includes five holes ( 620 m ) that were abandoned, and three holes for which assays are not yet available. 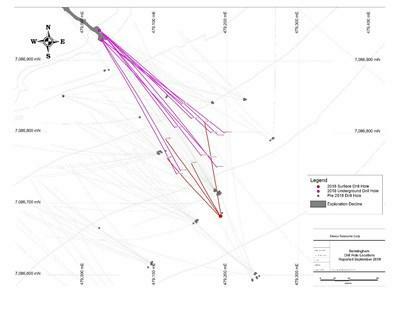 This release summarizes the results from eleven underground and four surface drill holes completed for 4,243 m for which assays are available. Overall, the drill holes were designed primarily to provide infill intercepts at spacings of 10 – 15 m centers in order to demonstrate geological and grade continuity in the upper levels of the planned mine development on the high-grade Bear Vein indicated resource, and to also intersect adjacent sub-parallel mineralized vein sets to extend the current resource. Alexco Chairman and CEO Clynt Nauman commented, "These results serve to reconfirm our confidence in the continuity and tenor of silver mineralization in what now appears to be one of the larger silver mineralizing systems in the Keno Hill Silver District. With these results in hand, we will immediately update the Bermingham deposit resource estimate, while also anticipating that the 2018 closer spaced drilling may result in some of the Indicated Resource converting to Reserves in our upcoming prefeasibility study scheduled for release in October." 11.16 m interval (8.03 m true width) from 214.64 m at 1,775 g/t (57.1 oz/t) Ag, 4.48% lead ("Pb"), 2.43% zinc ("Zn"); that includes the 5.51 m interval (3.96 m true width) from 214.64 m at 3,348 g/t (107.6 oz/t), 8.53% Pb, 4.51% Zn. Alexco owns the majority of the historic high-grade Keno Hill Silver District in Canada's Yukon Territory as detailed in its preliminary economic assessment (the "PEA") entitled "Preliminary Economic Assessment of the Keno Hill Silver District Project, Yukon, Canada ", which is dated March 29, 2017 , with an effective date of January 3, 2017 , which anticipates the sequential development of four high grade silver deposits over an eight year mine life producing more than one million tonnes with an average grade of 843 grams per tonne silver, 3.3% lead and 4.6% zinc. Silver production is anticipated to be approximately 3.5 million ounces per year. The PEA is preliminary in nature and includes inferred mineral resources that are considered too speculative geologically to have the economic considerations applied to them that would enable them to be categorized as mineral reserves, and there is no certainty that the PEA will be realized. Mineral resources that are not mineral reserves do not have demonstrated economic viability. Some statements ("forward-looking statements") in this news release contain forward-looking information concerning Alexco's anticipated results and developments in Alexco's operations in future periods, planned exploration and development of its properties, plans related to its business and other matters that may occur in the future, made as of the date of this news release. Forward looking statements may include, but are not limited to, statements with respect to the future remediation and reclamation activities, future mineral exploration, the estimation of mineral reserves and mineral resources, the realization of mineral reserve and mineral resource estimates, future mine construction and development activities, future mine operation and production, the timing of activities and reports, the amount of estimated revenues and expenses, the success of exploration activities, permitting time lines, requirements for additional capital and sources and uses of funds. Forward-looking statements are subject to a variety of known and unknown risks, uncertainties and other factors which could cause actual events or results to differ from those expressed or implied by the forward-looking statements. Such factors include, among others, risks related to actual results and timing of exploration and development activities; actual results and timing of mining activities; actual results and timing of environmental services activities; actual results and timing of remediation and reclamation activities; conclusions of economic evaluations; changes in project parameters as plans continue to be refined; future prices of silver, gold, lead, zinc and other commodities; possible variations in mineable resources, grade or recovery rates; failure of plant, equipment or processes to operate as anticipated; accidents, labour disputes and other risks of the mining industry; First Nation rights and title; continued capitalization and commercial viability; global economic conditions; competition; and delays in obtaining governmental approvals or financing or in the completion of development activities. Forward-looking statements are based on certain assumptions that management believes are reasonable at the time they are made. In making the forward-looking statements included in this news release, Alexco has applied several material assumptions, including, but not limited to, the assumption that Alexco will be able to raise additional capital as necessary, that the proposed exploration and development will proceed as planned, and that market fundamentals will result in sustained silver, gold, lead and zinc demand and prices. There can be no assurance that forward-looking statements will prove to be accurate and actual results and future events could differ materially from those anticipated in such statements. Alexco expressly disclaims any intention or obligation to update or revise any forward-looking statements whether as a result of new information, future events or otherwise, except as otherwise required by applicable securities legislation. Calculated at 30 g/t Ag cut-off with a maximum of two metres unmineralized internal dilution. Calculated at 400 g/t Ag cut-off with a maximum of two metres unmineralized internal dilution. Correlated Vein : BM = Bermingham, BM FW = Bermingham Footwall Vein, BR = Bear Vein, WD = West Dipping Vein.